Robert Frost, in his famous poem, “The Road Not Taken”, talks of two roads diverged in the woods, and how he can’t leave his trails on both .Similarly, degree students are at the crossroads with no idea on which way to turn after they have earned a bachelor’s degree- whether they should pursue postgraduate studies or enter the workforce. It's about choosing their future career/life. Choosing the right post graduate course and college is a crucial step in chalking the career plan. The problem is there are numerous possibilities open for students and persuasions come in from all directions, hence making a choice for a student is a challenging task. Therefore, it is wise to look at the pros and cons on both sides so that one can make the best decision. The best way to figure out whether one should go for higher studies or start doing a job right after one’s graduation is by talking to experts like seniors and career counsellors. 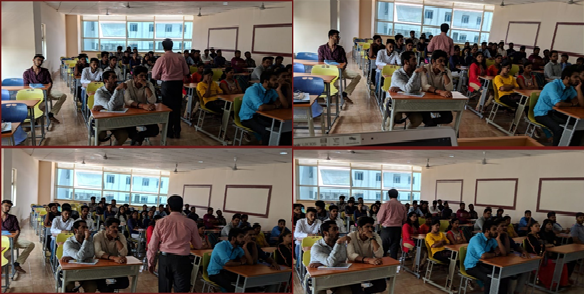 To refine their thought process and help students who are in a dilemma, a career orientation session was conducted for final year BCom and BBA students on 5 Apr’19 from 2:30 pm to 3:30 pm in Room G-07A. 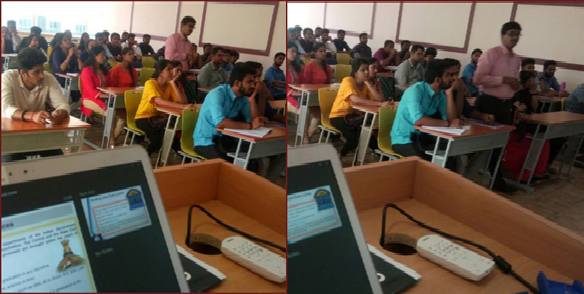 Prof.Muralidhar Reddy, Ph.D, MBA-HOD of CLAP Global MBA Programme and a renowned career expert addressed the final year students. CLAP ISB, the fastest growing business school based in Bangalore and Cochin, offers the most innovative MBA programme to create global professionals. 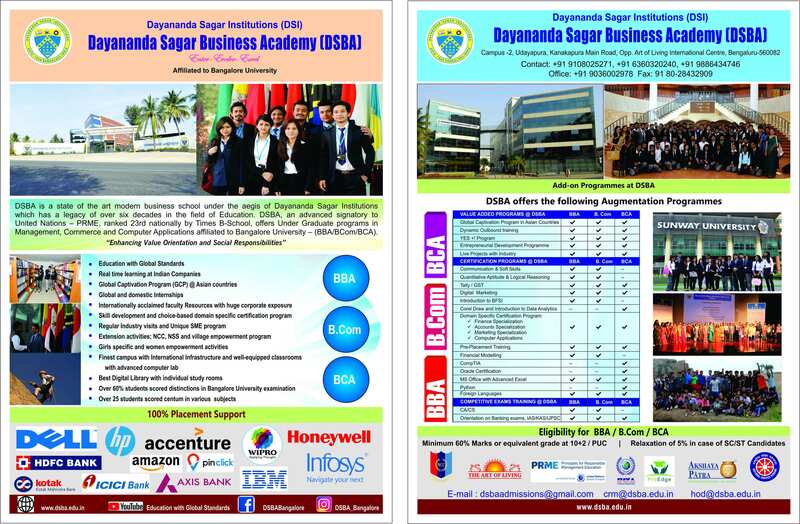 This is the most premier MBA programme in India, which offers an advance paid internship of six months at a foreign country, much before the commencement of the MBA course. 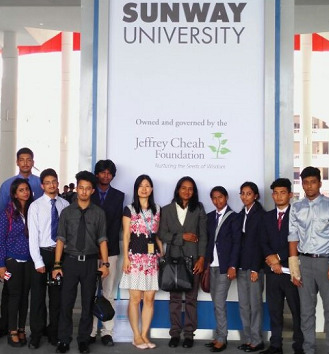 Being the top MBA College, they offer guaranteed employment through their unique Employability Passport Programme. Prof. Reddy is an academician with more than 15 years of experience. He has been a successful marketing professional in his early career and worked with couple of major business schools in Bangalore, where he moulded the growth of many students and bridged the gap between the college and corporate. He has done an extensive doctoral research on adoptive interventions in competency enhancement of individuals. His learning interventions have helped many small and medium enterprises to re-define their marketing and talent development policies and practices. He is a life member and a contributor to ISTE, MTHR Global, MTC Global and examination panel member of Symbiosis University, New Horizon College and Visvesvaraya Technological University (VTU), Belagavi. He has presented and published a dozen of research articles in national and international journals and conducted many seminars. His areas of expertise are Strategic Management, Supply Chain Management, Total Quality Management, Production and Operations Management, Strategic Marketing. In his interactive session, he touched upon various career choices that the students can make in public and private organisations as well as higher education opportunities available in professional and management sphere. He also emphasized on the various skill sets required by the students to excel in their career. The speaker’s experience and insights helped the students get a fair idea about what they should do and how they should proceed to build their bright future.